Walking the streets near to Supersonic Festival, the ubiquitous signs of neglect passing you by. Set into a decaying wall there is a headphone socket. You unplug from your own music and plug yourself into the city. The sounds you hear are of and from this place, dark and decayed. Sonic Graffiti was a co commission between Capsule and VIVID, artist and instrument inventor Sam Underwood installed miniature sound installations across the streets of industrial Digbeth. This commission led to many exciting opportunities for Sam Underwood, including an artist residency at iShed, Bristol. During this residency, Sam is investigating how fiction, narrative and storytelling might augment the experiences demonstrated by Sonic Graffiti, and is focusing on strategies and aesthetics suggested by ‘sounds of warning’ – alarms, alerts, announcements, themes of danger and decay. Capsule also put Sam Underwood forward for the PRSF New Music Incubator programme, for which he was successful. This programme brings together professional new music practitioners for a period of collaborative creative research and allowed Sam to develop his practice at a residency in Piteå, Sweden. 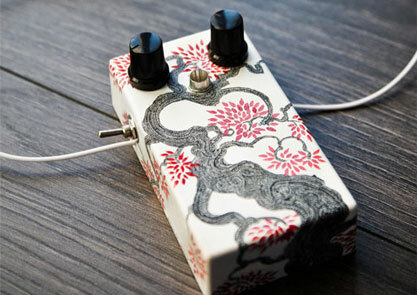 Following from his time on this programme, Sam set up a musical instrument making company, MortonUnderwood and created 10 unique Noise Box synthesisers for Supersonic Festival’s 10th anniversary.